InSassy (TM) Largest & Thickest Garden Kneeler Wave Pad offers the best comfort and protection for your knees whether you are gardening, bathing your baby or doing any chores that requires your knees to be on the floor. It is lightweight yet durable and wide enough to protect your knees from the elements. This is why the InSassy (TM) Garden Kneeler Wave Pad is the best selling kneeler on the market today! Made from High Density Foam and over 1 1/2 inch thick, the InSassy Garden Kneeler provides firm support yet soft and flexible enough for your knees. Exact Dimension of this Largest & Thickest Kneeler Wave Pad is 22" L x 11" W x 1 1/2" H which is hands down the largest in the market today. Built-in handle slot makes it a breeze to carry around while you are gardening. What are you waiting for? Your knees will Thank You! InSassy (TM) Kneeler Wave Pads are the Largest & Thickest size on the market which means your knees aren't crowded while you enjoy gardening. Exact Dimensions of this Cushion Kneeler Kneepad are 18" L x 8 1/4" W x 4/5" H - Large, 22" L x 11" W x 4/5" H - Extra Large, 22" L x 11" W x 1 1/2" H - Largest and Thickest. Ultra Light with Original Build in handle slot makes it extremely portable and a breeze to carry around whether you are gardening, making auto repairs or doing indoor chores. 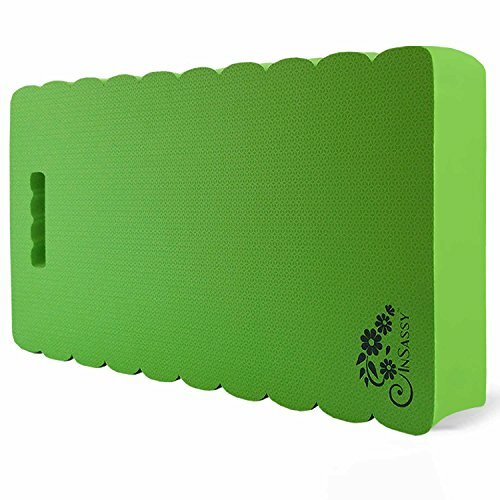 Multi-Functional - Gardener, Bathing Newborn Baby, Yoga, Prayer Time, Mechanic, Camping, Carpenter, Plumber, Painter, Household Cleaning Chores, Work, Exercise and more with this premium thick waterproof board!! If you have any questions about this product by InSassy, contact us by completing and submitting the form below. If you are looking for a specif part number, please include it with your message.